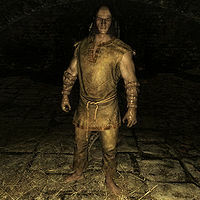 Gian the Fist is an Imperial thief located in the Ratway beneath the city of Riften. As his name suggests, he uses unarmed attacks that do significant damage. Gian lives in the southwestern chamber of the Ratway and has booby-trapped it with bear traps. He has an alchemy lab, an arcane enchanter, and a hay pile at his disposal, although he never uses them. He is hostile and will attack you on sight. Gian wears a roughspun tunic and the unique gloves of the pugilist. He carries a bottle of ale, inn food, and a small amount of gold. If you are level 16 or above, he also wears a leveled ring of regenerate stamina. This page was last modified on 9 November 2016, at 17:32.